Stand Up Comedy WordPress Themes is a template to easily create stand up comedy or entertainment website for comedians with WordPress. This is considered as one of the best Comedian WordPress Themes in 2019. StandUp Comedy WordPress Theme is supplied with awesome crips functionality to build a complete professional website with WordPress. 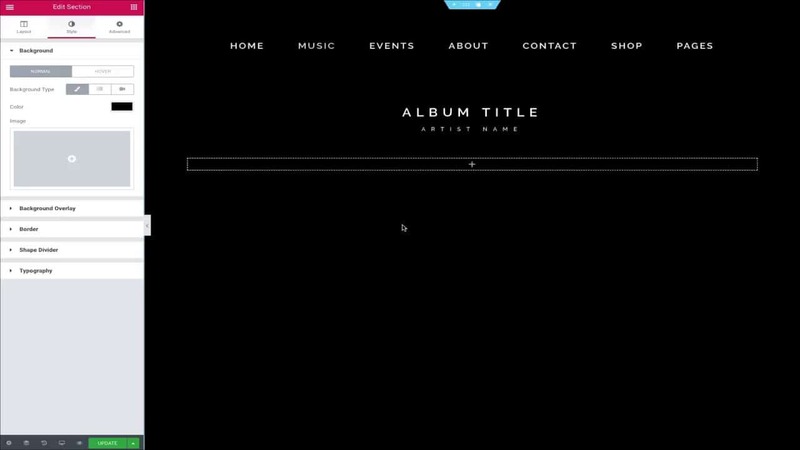 If you are a comedian, comic or even run a comedy club, Stand-Up Comedy WP Theme is the perfect catch. 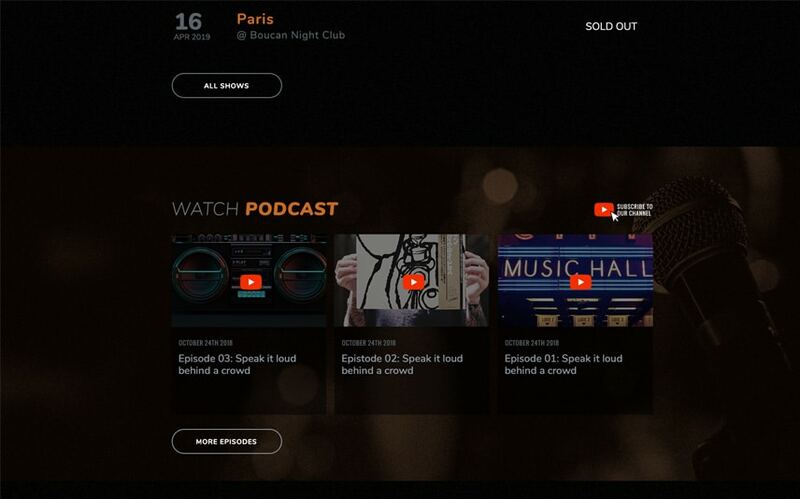 Among all its features, this template is eye-catching with its solid podcast video showcase where comedian will be able to upload podcast from YouTube directly within the WordPress dashboard. Embed your YouTube channel or YouTube playlist to showcase your podcast. As soon as you upload a new video on YouTube, it will display on your website! 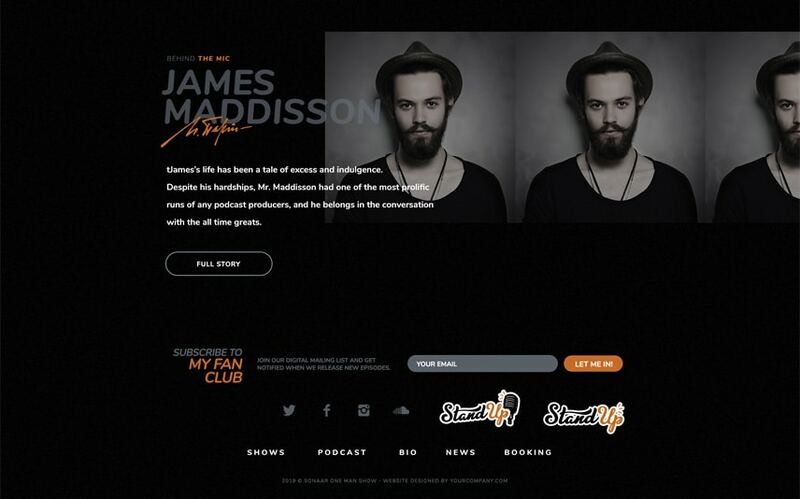 Stand Up Comedy WordPress Theme provides more than 40 pre-designed page templates and layouts that are easily editable. You can change the order of the homepage blocks, add new ones or remove any module you don’t need. 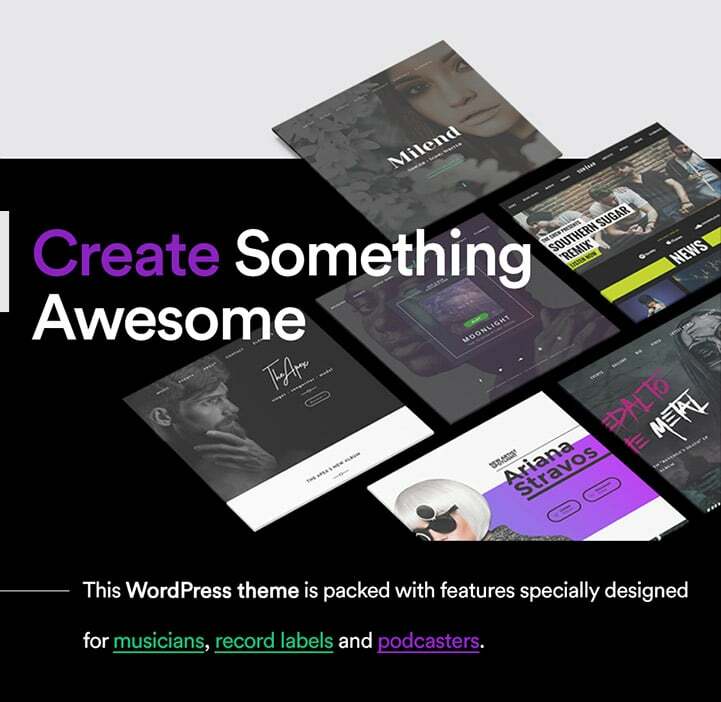 This theme is one of the most flexible WordPress theme ever built. You can add unlimited numbers of widgets on any pages. By example, if you want to add an Instagram feed or a podcast audio player on your homepage, simply drag and drop the corresponding widget anywhere you want and edit its visual aspect using a color picker, font selectors, and typography font size slider. You can adjust the margins and the paddings of each modules and have the option if you want them to be displayed on mobile, tablet or desktop. 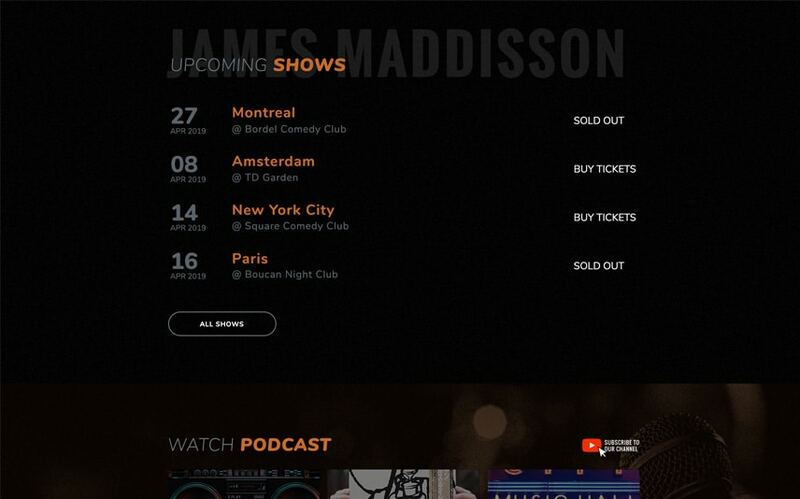 This entertainment WordPress theme has every options you need to built a solid responsive and mobile-friendly website to showcase your performance and comedian career. More than 20 000 comedians and artists use this template. 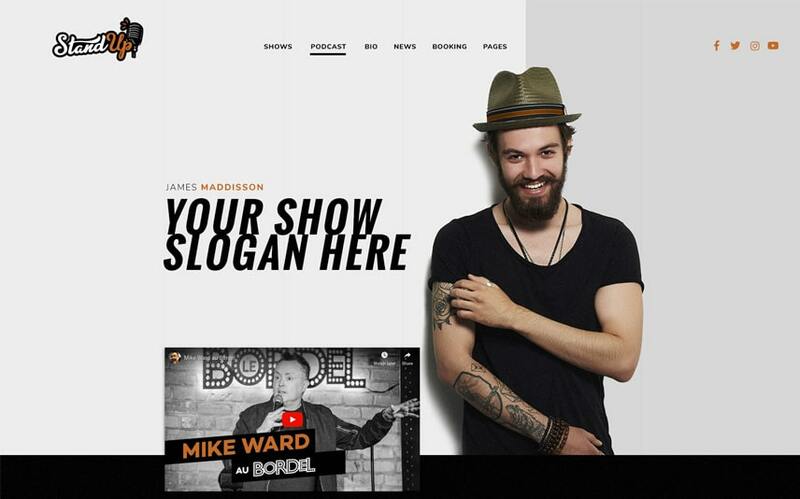 This is definitely the best WordPress themes for comedians, comedy clubs and comic, in the entertainment industry in 2019. We have also included several Premium WordPress plugins that you can use to extend the functionality of your website. The plugins included are Essential Grid to build flexible media grids (Instagram, YouTube channels, Facebook feeds, Photo and Video galleries, blog posts, podcasts and episodes, etc), Revolution Slider to present your best head-shots in a beautiful animated slider and Elementor (Free version) to help you design your website without a line of code! This is a perfect match for comedian beginners who want to create their own comedy website and push their artist career to a next level. If you are an host of a popular YouTube channel, runs a theatre website or comedy podcast show, speaks at international events (international speaker), start a comedy club networks, performing arts events and gigs, ballets, opera or simply love to perform under the spotlight, this new micro-niche WordPress theme is the best pick to showcase your talent. This comedy podcast wordpress theme is clean, modern and fully responsive. It’s compatible with the latest version of WordPress 5.x and Gutenburg and also includes regular updates and free customer support to help you with any issues you may have. Stand Up Comedy WordPress themes works seamlessly with WooCommerce plugin which allows you to transform your comedy website into a solid eCommerce platform where you will be able to sell your merchandise and promotional objects.